Electricity, electronics, physics, industrial maintenance and environment: disciplines where measurement is involved at every stage. When studying Science and Technology, measurement is essential to observe and understand theoretical phenomena through practice. Measurement of the characteristics of a component or system with our measuring instruments, their behaviour in their environment and their evolution over time plays an important role in both initial and higher education. From the simplest instruments to use for initial training through to the most complex encountered by students once they start work. See examples in the magazine "Les Cahiers de l’Instrumentation." In Electronics classes, the students discover techniques which use electrical signals to capture, transmit, process, store and view information thanks to industrial electronic and IT equipment and systems. In Electrical Engineering classes, the students learn how to operate and maintain electrical systems in the production, transmission and distribution of electrical energy, as well as electrical machines and systems (electromechanical systems, industrial PLCs, control equipment, electronically-controlled systems, etc.). In this digital age of communication, measuring instruments are evolving due to new technologies. new applications are appearing. For example, we can now connect oscilloscopes to computer networks, record data viewed by the whole class and thus make teachers' jobs simpler. One of students' first introductions to electrical quantities, in middle school, involves measuring and then viewing the waveform of a signal. Multimeters or oscilloscopes with a multimeter function can be used for this first introduction and to identify the fundamental characteristics: amplitude, frequency, etc. Analogue oscilloscopes, widely used in schools, can be used to analyse the noise in a signal or the pitch, the best known example of analysis of a signal's purity. .
Due to their bandwidth and their signal analysis and communication capabilities, benchtop digital oscilloscopese can be used to learn in further detail about more complex concepts. Lastly, the Scopein@box models from Metrix® are instruments which can be integrated seamlessly into a high-level educational environment. They are connected to a computer which allows the teacher and the whole class to view and manipulate the measurements performed. There are educational versions of these instruments available for initial training. Specific sensors for measuring current and a wide range of accessories enable these oscilloscopes to handle all requirements and applications, thus ensuring versatility. The rooms used for practicals are also traditionally equipped with stabilized or adjustable power supplies protected against short-circuits, and function generators, from the most simple (generation of sine, square or triangle waveforms) to the most complex (arbitrary signals), alongside the multimeters and oscilloscopes. In these classes, converters, motors, generators and transformers are all presented. These classes involve numerous measurement operations characterized by the presence of significantly higher voltages and currents. Understanding and implementing electrical safety are major issues. 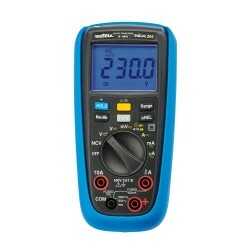 From voltage detection with a Voltage Absence Tester, to TRMS measurements (AC / DC / AC+DC with multimeters and multimeter clamps), the measuring instruments used in recurrent operations are equipped with simple functions (resistance, continuity, capacitance, etc.) as well as more complex ones (differential and relative measurements, etc.). Wattmeters and wattmeter clamps, as well as the Qualistar+ single-phase and three-phase power analysers. L'intérêt de celui-ci porte sur la multiplicité des mesures qu'il réalise (4U/4I, harmoniques, transitoires, inrush...) associé à un large choix de capteurs de courant. To learn how power command-control systems function, you need to view complex electrical signals with different amplitudes and electrical references. Our Handscope and Scopix portable oscilloscopes with isolated channels can be used to perform these operations in total safety. Equipped with high-level trigger and analysis modes, these field oscilloscopes also offer multimeter-recorder and harmonic analysis modes enabling students to do their practical exercises simply and effectively. To ensure electrical safety on an installation, you need to understand and implement techniques to ensure earthing, insulation and continuity of the protective conductors and active protection systems. Our electrical installation testers give you a single instrument which allows students to understand and perform the measurements associated with these techniques. Les techniques de Infrared thermography techniques are also taught. Essential tools for industrial maintenance, our thermal cameras enable students to practise what they have learnt and apply these techniques. … or to simulate an environment not available in your teaching premises.
. Infrared thermography test bench. Drawing on its close, privileged relationship with the French National Education system, the Chauvin Arnoux Group accompanies the actors in education by participating each year in a large number of events and by publishing the "Cahiers de l’Instrumentation" magazine. The Club du Mesurage (Measurement Club) was founded in 2000 with the main aim of pooling requirements to teach measurement and ensuring that measuring instruments matched the changes in the syllabuses of high schools, universities and engineering schools. The club's members are drawn from the General and Regional Inspectors in the French National Education system and managers from the Chauvin Arnoux Group. This led in the same year to the creation of the Cahiers de l’Instrumentation, an annual publication distributed as a preview on the Chauvin Arnoux stand at the EDUCATEC trade fair in late November. The Cahiers de l’Instrumentation is also mass-distributed to people involved in technical and scientific education. 10,000 copies are sent free of charge at the start of each year and others are handed out in local meetings. The Cahiers de l’Instrumentation deal with measurement in all its forms: news, practical exercises done at high schools, education dossiers, reports, etc.